Millions of Church members throughout the world have not been able to access higher education for many reasons — costs are too high or they may lack the time, confidence, or practical local options. 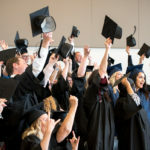 Since 2009, Pathway has already seen some of those barriers reduced by paving the way for tens of thousands of people to get an education that before may have seemed impossible. And soon, thousands more will have a similar opportunity thanks to the Global Education Initiative. Through the CES Global Education Initiative, several Church organizations will collaborate to provide educational opportunities to Church members throughout the world. These organizations include PathwayConnect, Church colleges and universities, Self-Reliance Services, and the Missionary Department. Religious education will be an essential component of each program offering, which will include options for secondary education, English-language instruction, university courses, technical and skills-based training and certificates, undergraduate degrees, and master’s degrees. The initiative will include religious instruction, gathering experiences, and a spiritual focus to online learning. The initiative will be a collaborative, system-wide effort, involving all CES institutions and other Church departments. Instruction will be delivered online and in local gathering activities at institutes and Church meetinghouses in addition to instruction through local educational providers, including technical schools, colleges, and universities. Students will access programs through their local Church units, guided by priesthood leaders and supported by CES and Self-Reliance Services. This pattern ensures the work takes place under the direction of priesthood keys. 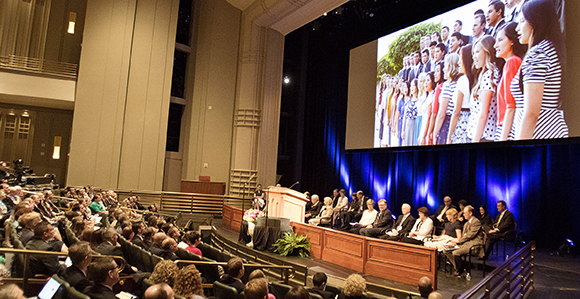 Elder Kim B. Clark announces the CES Global Education Initiative. Photo by Hans Koepsell, Deseret News. 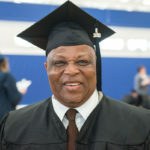 ^ Elder Kim B. Clark, “The CES Global Education Initiative: The Lord’s System for Education in His Church,” Seminaries and Institutes of Religion Annual Training Broadcast, June 14, 2016.